Did you know identity thefts occur more in the summer than any other season? In fact, there’s been a significant increase in identity theft cases—over the summer travel season—since 2010. According to the US Travel Insurance Association (USTIA), the increase in social media, mobile capabilities and lax consumer behavior are responsible for the spike. Because FirstBank values the privacy and safety of our customers, we’ve outlined the top tips and tricks to help you protect your identity. Be a little less social on social channels. The biggest target for identity thieves are individuals ages 20-39. That same age group also happens to be the most active on Twitter and Facebook. Identity thieves use social channels to find out personal information like family names, where you went to school, your birth-date and more, so make sure your settings are protected. Or better yet, don’t list any sensitive information. Social media over-sharing doesn’t just lead to identity theft. People who are vocal about upcoming vacations are more apt to have their homes broken into. So as much as you want to brag about your upcoming Caribbean vacation or post real-time photos of that clear blue water and delicious Rum Daiquiri, give yourself some peace of mind and wait until you return home. Guard your smartphone. One in 14 smartphone owners has been a victim of identity theft, according to a study by fraud tracker Javelin Strategy & Research. The simple truth is that smartphones are no longer just phones. They’re a goldmine of data with more private and financial information than your entire purse or wallet. Always ensure your smartphone remains in your possession and secure it with a pass code. In addition, consider turning off or disabling unnecessary features to minimize the number of potential entryways hackers can use. Avoid ATM Skimming. Card “skimming” has become a popular way for identity thieves to steal your ATM card information. 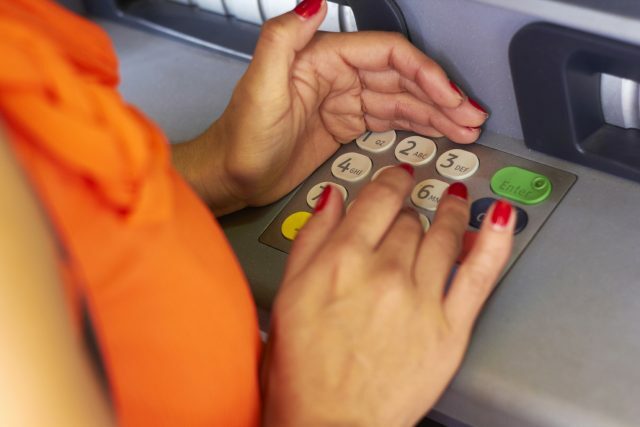 Basically, a “skimmer” is a tough-to-spot device that thieves attach to ATMs. Because many skimmers look like they are actually part of the ATM, the can be near impossible for consumers to identify. Fortunately, most bank employees are trained to identify skimmers and check their on-site ATMs on a daily basis to ensure the machine’s security. It’s worth getting cash out at a bank ATM as opposed to that sketchy convenience store next door. You’ll thank us later. Set up alerts on your debit, credit cards and bank accounts. FirstBank’s customizable email and text message alerts automatically notify customers of fraudulent or bizarre account activity (added bonus: they also let you know if your account balances are low). Thanks to these alerts, customers can catch suspicious activity beforehand and immediately stop any additional transactions from going through. Additionally, FirstBank and many other financial institutions have dedicated fraud departments and fraud detection services that recognize any fraudulent activity or spending patterns that don’t align with your usual purchasing behavior.